DIAL: Silver dial with minutes graduation ring, luminous Arabic hour markers, large subsidiary seconds at 9 o’clock, 12 hour counter at 3 o’clock, Blued hands with large Red central minutes chronograph hand. Hours and minutes hands filled with luminous material. CONDITION REPORT: The watch is in overall good condition, the dial has an evenly aged patina. The radium markers on the dial appear to have been reapplied with tritium according to UV light and geiger test. The hour and minutes hands center luminous material has darkened over time, but appears original. The case is still sharp and not over polished, may have been polished once if any. The movement is functioning properly, including the central chronograph minutes counter. Longines was known throughout the 1940’s, 50’s and early 60’s for manufacturing some of the finest in-house chronograph movements in Switzerland. In the opinion of many collectors, 13ZN and the subsequent 30CH, are the best in terms of technology and quality. 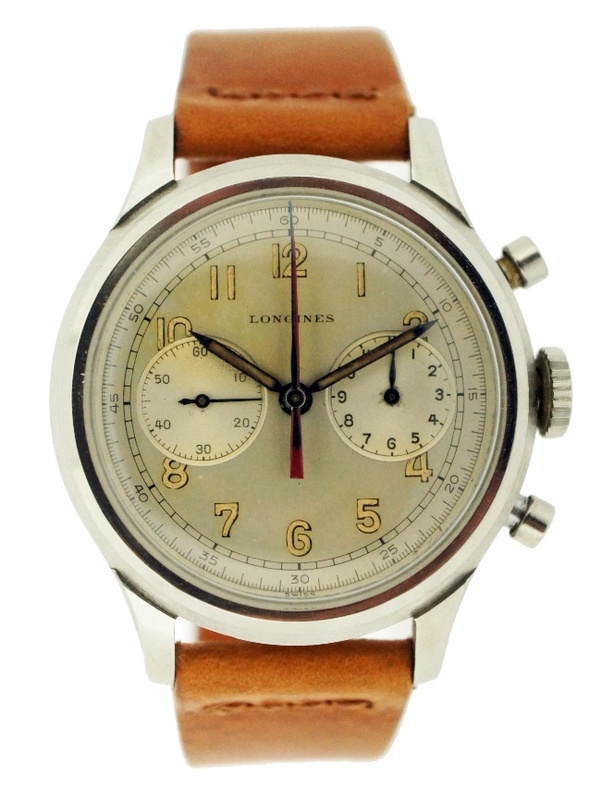 The 13ZN caliber gave way to the 30CH chronograph, which was a slightly upgraded (though somewhat less desirable now) in-house chronograph, before Longines ceased the production of in-house chronographs in the late 1960s. The 13ZN12 has the unique feature of incorporating the minutes chronograph in the center of the dial and using the dial itself as the third register. This watch comes with an archives extract confirming this watch was invoiced to Longines-Wittnauer the agent for Longines in USA in 1947.